Hipster atmosphere, late-night hours, and thin-crust Connecticut pizzas, which include toppings like mashed potato with bacon and cheese, or Little Neck clams. Inexpensive. Sunday 12:30 p.m. to 2 a.m.
Aug. 11, 2008 @ 11:26 p.m. This place just looks like a huge, brick warehouse. It's open late, which is great. And, the variety of pizza toppings will blow you away. I had mashed potatoes and spinach on one. Delicious. They are huge pizza pies, and a good value. The 20 something hipster crowd can be annoying, but hey...what can you do? Oct. 10, 2008 @ 12:26 p.m. 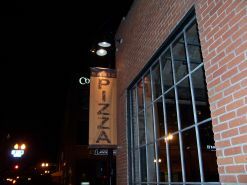 The line that gathers around the corner to get into this place may have you thinking that this brick warehouse is a trendy club rather than a pizza place. It's menu is just that...basic. This restaurant strictly serves pizza, but toppings are endless, including unheard of toppers such as mashed potatoes. The drink menu is anything but basic; in fact, nearly ten different reds and ten different whites make up the wine list (all at a reasonable $30 per bottle), and the list of bottles of liquor from which you may choose is extensive.